KELLER, Texas, Sept. 13, 2018 /PRNewswire/ — Linux Academy, a leading provider of hands-on online training in Linux and cloud technologies, today announced it has acquired Jupiter Broadcasting, a podcasting network covering Linux, security, privacy, community and other open source content, to further strengthen its contributions to the open source and free software industry. Linux Academy will acquire Jupiter Broadcasting’s shows, assets, and employees. 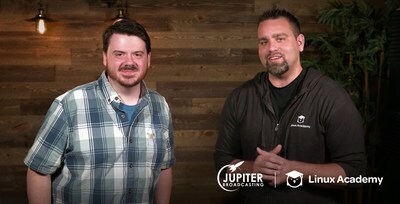 Jupiter Broadcasting, founded in 2008, provides informative, high-quality entertainment through podcasts and shows to industry enthusiasts and professionals. Combined with Linux Academy, the companies will expand on what they do best and open source their shows, production pipeline, and any tools they create to automate. The companies share a mission to inspire people to follow their passion, learn, explore, and further their ambitions through knowledge. “As part of Linux Academy, we’re going to do more than make better content, we’re going to contribute back to our community. Not only do we want to see even more great content get created, we’re going to help everyone get started, no matter where you are in your journey,” said Chris Fisher, Jupiter Broadcasting Co-founder. Chris Fisher will operate as VP of Community at Linux Academy and continue running open source podcasting and web shows. “We are so proud to welcome the Jupiter Broadcasting team to Linux Academy. This merger has far-reaching benefits for our community, students, and employees as it allows us to unify and continue to enhance our open source contributions. In a world of digital transformation, it is important to recognize our community responsibilities. By bringing the two communities together, it will empower and enable both communities to achieve more in their paths to success,” said Anthony James, Linux Academy founder and CEO. Linux Academy is a leading provider of high-quality, hands-on online training for individuals and teams who are looking to develop their skills, get continuous training, or get certified in Linux and the latest cloud technologies. Through self-paced courses, interactive diagrams, hands-on simulated labs, cloud servers, personal access to expert instructors and an ever-growing training library, Linux Academy caters to beginners and experts alike. Courses are geared toward certifications in Linux, AWS, OpenStack, DevOps, Azure, Big Data, Google Cloud, Security, Big Data and Containers.